This bar is designed to mount a fire extinguisher safely in a Fiero. This bar also doubles as the mounting place for the 5th and 6th point in a seat belt harness system and keeps the belt from sliding around. Mounting tab must be drilled to except your fire extinguisher. No modification to the car is required. 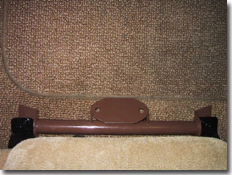 Mounts under the seat rails. Seat cannot be moved forward when the fire extinguisher is installed on it. Recommended to be mounted on the passengers side. Constructed with a chromemoly tube, tig welded, and arrives unpainted so color choice is up to you.